In 2015, a 30 second Super Bowl TV ad cost 4.5 million dollars (Source: Syracuse). What’s the ROI in that? Despite the exorbitant cost and lack of clear-cut metrics to measure the value of a prized Super Bowl ad spot, big brands continue to pay the high price every year. There are certainly benefits to having your brand featured during one of the most anticipated and watched events in the United States. In 2015, Super Bowl XLIX reeled in 114 million viewers, breaking all TV viewing records (source: ProFootballTalk). If a brand has a Super Bowl ad, one can assume that the company would raise a significant amount of brand awareness – and hopefully (maybe) trigger a flood of new sales. Traditionally, companies would assess an ad’s impact by using surveys and measuring media mentions and purchases around the time that the ad went live. But, that’s clearly not an exact science, or even data that I would feel confident using to back up a pitch about why my brand needs another Super Bowl commercial – or television ad campaign – this year. However, offline advertising like TV ads, can now use online marketing channels to measure its value. After viewers see a television commercial, where is the first, most accessible place that they can learn more about the ad? Search engines. Budweiser is one of several large national brands that pay to feature an ad in the Super Bowl every February. As the Google Trends Search Report shows below, the number of branded search queries for Budweiser spikes every February – especially since its 2013 debut of the farmer and clydesdales commercial series. Doritos is another brand that has become a staple Super Bowl ad producer. Since Doritos’ hilarious 2010 commercial during Super Bowl XLIV, Doritos branded search queries spike every February. In recent years, it’s not only big powerhouse brands who find the extra funds for a Super Bowl ad. Squarespace, a relative newcomer to the ecommerce software industry, created an ad that featured Jeff Bridges making his own Sleeping Tapes that aired during the Super Bowl in 2015. The result? As the graph shows below, there was a huge spike in branded search queries for Squarespace in February that year. It’s important to note that brand recall – remembering the exact company (or language) associated with a commercial, is tough! 10 percent of those surveyed after the Superbowl thought they saw an ad from Audi or Volkswagen even though both brands were not advertisers that year, while just 20 percent of people surveyed recalled the Mercedes-Benz ad that actually aired (Adweek). Despite the fact that many people do not recall the exact brands from ads, they may still be interested in learning more about the main themes or messages in the commercial. Thus, when they go to search online to find more information – they will most likely use long tail queries such as “beer commercial with horse” or “commercial with jeff bridges and sleeping tapes.” Long tail keywords such are these are harder to detect, yet they are equally as important as branded search queries. Although Super Bowl ads have the highest amount of viewers tuning in, regular television ad campaigns should also take into account the importance of search. For example, Liberty Mutual has been airing a series of new commercials about replacing customers’ cars after an accident. However, the insurance company is missing several prime opportunities to connect with users through Search. (Shout out to Ali Freeze for first identifying this trend and sharing it with me!). When searching using Liberty Mutual’s exact language from the commercial, “insurance that replaces your car,” in Google, Liberty Mutual ranks first and has an answer box. 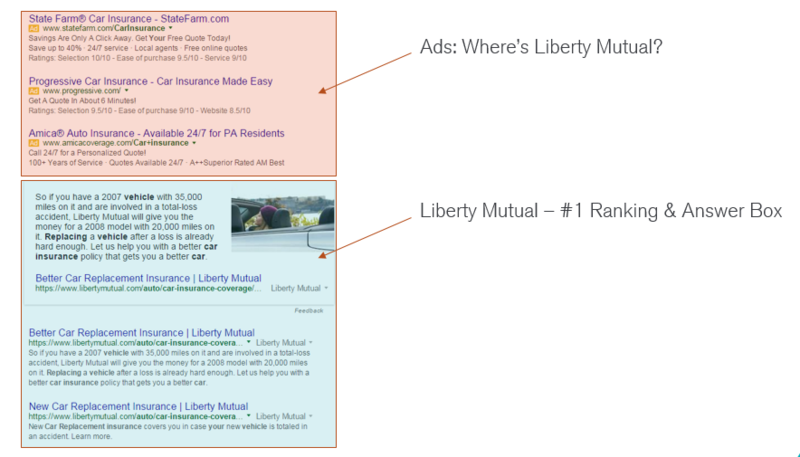 However, Liberty Mutual is missing the mark with PPC ads, as their direct competitors are appearing for these keywords. Given that ad brand recall is very low, many people won’t search using the exact phrase from a TV commercial. For example, they may conduct a search query for the phrase “insurance that buys you a new car.” When searching for this phrase in Google, Liberty Mutual’s competitors are outranking them in ad space again, while their web content is only ranking number 7 in the organic results. 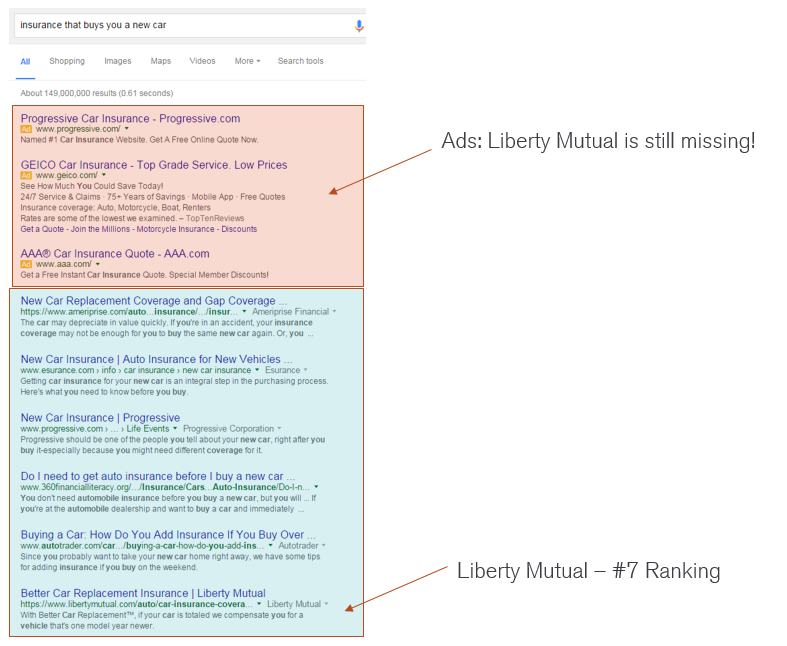 Additionally, for the long tail query, “insurance that covers a new car,” Liberty Mutual is not ranking at all for PPC ads or in the organic results. Combining TV advertising with digital marketing efforts requires extra planning and cross-functional collaboration, but it allows both marketing and advertising teams to get the most return on their investment. If you are interested in joining forces with digital marketers and using a ton of data to help prove the value behind those pricey tv commercial costs, try implementing the following tips! There are hundreds of ways a user could search for a phrase or theme mentioned in a commercial. Tools like Adwords’ keyword planner, Google Suggest (a.k.a. Google something and don’t press enter), and Ubersuggest allow you to uncover long tail keywords that correlate to your brand’s TV commercial. By identifying a variety of keywords that are associated with your commercial’s topic, you can create content that entices users at later stages in the marketing funnel, when they are more likely to make a purchase from your brand. Check out these posts to learn more about the importance of long tail keywords and how to conduct keyword research. Once an ad goes live, search queries around the ad will spike. At times, it takes Google several days or even weeks to register new pages on your website. However, this can be tricky because many companies do not want to release any information about a new ad campaign before it goes live on TV. If you can’t get the online content live before the actual air date of the commerical, make sure that all landing pages, blog posts, guides, etc. are ready to go live the day that the commercial airs. By using PPC campaigns, you can ensure that your content ranks for related queries to your commercial – even if your pages aren’t ranking in the organic results just yet. Viewers are going to search for information about your ads – whether you like it or not. Why not encourage users to search for your ads using a specific phrase? Wayfair, an online furniture and accessories retailer, has been airing a series of ads that directly ask viewers to search for their products using the term, “Wayfair your home.” This year Wayfair made the top 10 most improved companies online to rank on page one in the search results – along with Etsy, Groupon, and Instagram (Source: Moz). It’s safe to assume that the search call-to-actions in their TV commercials helped contribute to the brand’s improved presence in the SERPs. In addition to ranking for 48 percent more keywords on the first page of Google, Wayfair has seen an 69 percent increase in revenue from organic traffic (Source: Search Engine Land). Some brands just don’t have the budget for television ads and can’t compete with competitors’ big tv spend. Luckily, smaller brands can possibly reap the benefits of competitors’ TV ads. Investigate where your competitors are missing the search mark. What non-branded terms are audiences looking for in relation to the competitor’s television ads? 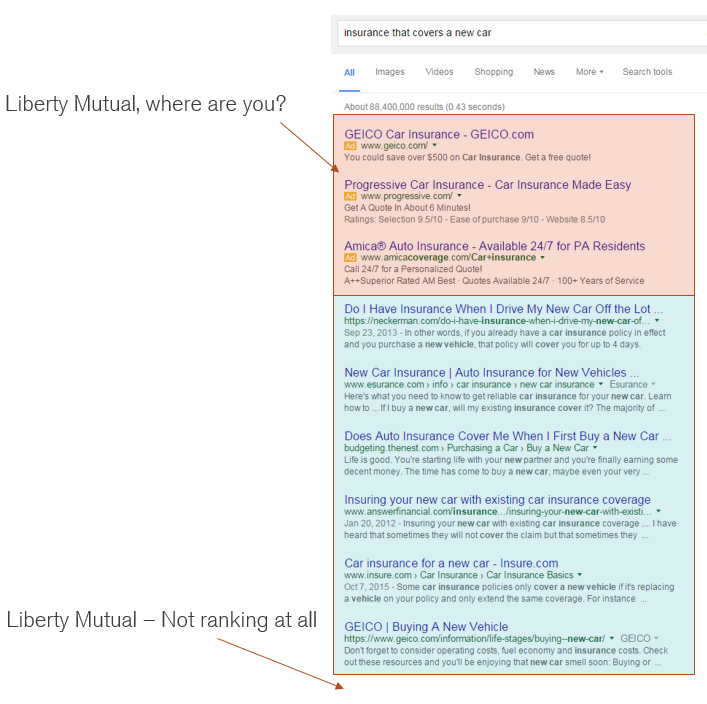 In the example above, Liberty Mutual isn’t ranking for several long tail keywords; yet their competitors own the organic search landscape for those terms. If your brand has some advertising budget, consider investing in PPC ads that hit on those key terms in your competitor’s successful TV ads. Progressive and Geico search ads are ranking for long tail keywords around Liberty Mutual’s commercial, but Liberty Mutual’s ads are nowhere to be found! 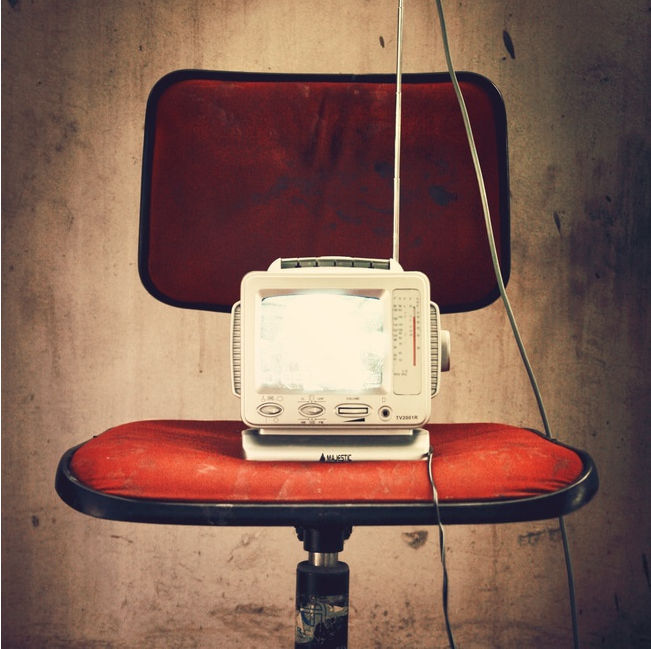 Has your brand had success with tieing digital marketing efforts to television ads? Share your experience in the comments below or tweet @lauramckane4.